A warm welcome to our website www.himalayanhigh.in In this page you will come to know almost everything about us. We thank you for your patience for reading it and your interest in knowing us more. It feels pleasure to introduce Himalayan High to the Adventure Breed. We being lucky to have The Great Himalayas with us, Himalayan High is here to take you deeper and higher up in the Great Himalayas, make you feel ecstatic by its high peaks, mesmerized by its aura, awe-inspired by its might and thoughtful by its spirituality, but not limited to that..
Himalayan High is a Trek and other Outdoor Tour Operator in the Himalayas of India, Bhutan and Nepal. The company is perfectly located in Jaigaon - a small town of West Bengal at the junction of Bhutan, Nepal, Sikkim and North East India. The tagline of Himalayan High reads Promoting Pure Himalayan Adventures. Trekking and mountaineering had always been our dream. However, belonging to a middle class Indian family who valued education and a secured job, we got drifted apart from our soul, but not for too long !! Suman, who owns Himalayan High left behind all the luxuries of life and a high paying, fast growing job of the corporates, went against the wishes of his family and the laws of the society, to get back to the Himalayas. Himalayas had always been his first friend right from his childhood, which he grew up with, be it running away from his home to play swimming in its rivers, or go for hikes around to the corners of the mountains nearby with friends, looking out for exciting elements (as a child ) to play with, be it hidden waterfalls, caves, birds, oranges and lots more.. That's where his soul lies and when he got back to it leaving everything, he started to breathe again. He used to trek before, but after leaving his job, he proved his free soul to himself. He trekked the Himalayas unguided on his own, guided solely by the moods of the mountains. Completing the mountaineering courses, trekking the Himalayas unguided and guided, picking up skiing, bicycling, motor biking, making new long lasting friends each day, he started to live a life of a free soul. To earn money, he freelanced as a software developer to make websites and application software for small businesses. He was moving on quickly with his life travelling to the corners of the Himalayas. Soon, he joined an organization as a trek leader where, for the first time he was confronted with the commercial side of this trade. Offcourse, being a purist, he did not quite like that..
His conscience was awaiting a major change. Here from inside, it was everything else, but the Himalayas..
That's when this strong idea overtook his mind to clean the space with his own ability as much as he could. It was not possible without making trekkers realize the actual might of the Himalayas, the spirituality of its presence to be inspired from, the rare beauty which makes you go silent at, rather than making it loud and showing it off !! To start with, he started an organization and named it "Himalayan High". We are ethically driven trained mountaineers who considers Himalayas Godly and are motivated to change the spirit of trekking in India, which is currently maltreated by other big organizers for profit, spammed by wannabes, faked by Bollywood and dominated by the desire to achieve a trek, rather than living a trek. 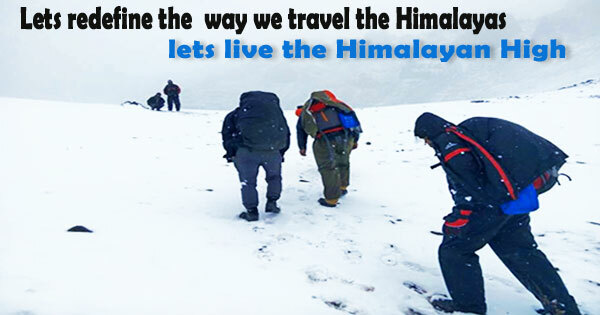 We at Himalayan High are trained and qualified mountaineers, but not just that. We had been and will be trekking and going further UP and to the corners of the Himalayas. Team Himalayan High is a start up and is building up day by day. Our focus is to give you the best experience of the Himalayas, but as we all know, venturing into the Himalayas for some real adventures like trekking and mountaineering involves lots of planning, logistical and professional help. We take off you, all the pain involved in planning an expedition and gathering logistical and professional support. Huge planning is involved in safeguarding your team's Physical and Medical Safety. Emergencies on any adventure are something which always needs to be given a priority and handling of those delicate situations needs even better planning, experience and capability to handle that crisis, at that very moment. Our planning prioritizes medical safety and emergency evacuation strategies, and we put all of our previous experiences into it. We are a team of experts from the field with lots of practical experiences of handling a Himalayan Journey. Lots of trekkers have used our services to gift themselves a memorable trek experiences to keep with them for lifetime. We look forward to take care not only of your Logistical and Professional requirements, but also see to it that we give you MORE in form of what you witness and what you take back as your experiences of the Himalayas. We are deeply and crazy in love with the Himalayas, and our efforts are made to transmit the very disease to all of our trekkers/mountaineers. We mean Quality, Safety, Comfort, Inspiration and the most important - Love for the Himalayas. Come together, let us feel The Himalayan High ! !